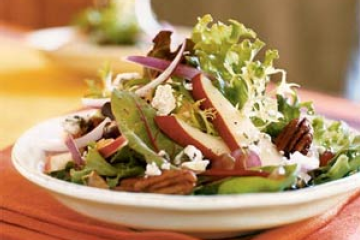 A crispy salad with sweet Asian pears, crunchy pecans, creamy Roquefort cheese, and tangy dressing! Saute the ¼ cup of sugar with the pecans over medium low. Stir constantly for a couple of minutes or until the pecans become caramelized. Carefully transfer nuts onto waxed paper. Cool, and break into bits. For the dressing, blend oil, vinegar, 1½ teaspoons sugar, mustard, chopped garlic, salt, and pepper.